Most smart bloggers try to focus on a few, key search terms in their blog content. But the reality is, your blog is probably a lot more broad than you think. Last week, I co-published a white paper with Chris Baggott, the CEO of Compendium Blogware (I’m on their advisory board). 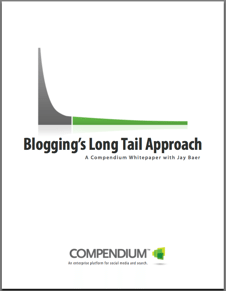 The free “Blogging’s Long Tail Approach” white paper is devoted to describing this notion of blog content breadth, and its impact on search term selection, and search term optimization. According to Experian-Hitwise, 56% of all searches are now three words or longer. The use of 8-word search queries grew 22% in the past year alone. While there is often more volume for one and two word searches, the longer searches are generally much more specific, indicating consumers that are farther along in their intent to purchase. Which is closer to buying, a consumer searching for “flat panel TV” or a consumer searching for “26 inch 720p flat panel TV.”? Because of the specificity, it’s much easier to achieve a top 10 search engine ranking for long tail searches, and higher rankings = higher conversions. Last month on Convince & Convert, 6,243 incredibly discerning folks visited from some sort of search engine query. That group used 3,126 different search terms to get here. The most popular search phrase – “social media strategy” brought 837 visits, and 2,654 search terms were used by just one visitor during the month. I typically focus on 10-20 search terms when creating content for this blog, but yet 3,126 search terms were used to get here. I need to do some serious analysis to see how those 3,126 terms fit together, and dramatically expand my keyword usage. While this is important for a blog like mine, it’s flat-out critical for e-commerce companies, and others that are blogging for business. That’s where software like Compendium comes into play, because they can very much help optimize a blog for the long tail, enabling you to rank top 10 for hundreds (even thousands) of low volume, high value terms. If you get a chance, please check out the white paper. Also, if you have a blog, would you be willing to leave a comment with the number of search terms people used to get to your blog last month? That would be a interesting exercise, wouldn’t it?